With our exclusive partnership with LinkedIn, EverTrue supercharges your existing database with up-to-date career information. Use search filters to look for constituents in certain industries (technology, medicine, finance, etc.) to create networking events or panel discussions. Ask the people you locate to speak or attend and build the value of your alumni network. 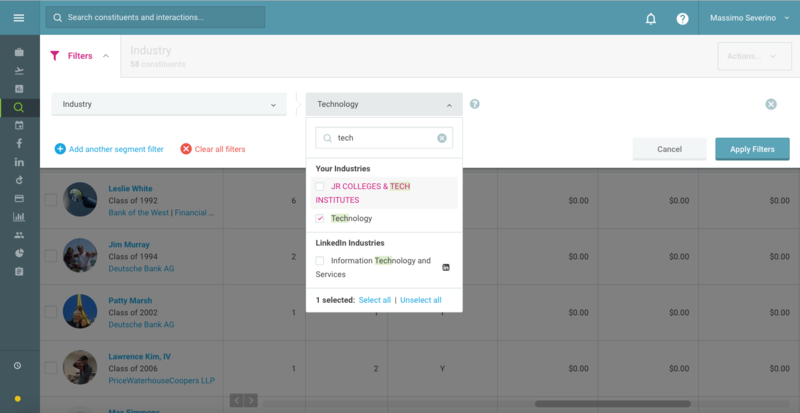 Using the 'Industry' filter, you can segment your constituents based on their career field. Results: Create popular and well-attended networking events for alumni within different industries. Advertise these events to interested people and build the value of your alumni network.